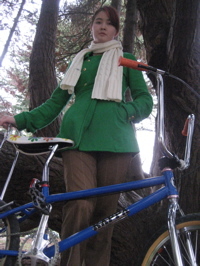 My girlfriend didn’t metamorphose into a diehard cyclist after I gave her a bike, but she has fun on it. 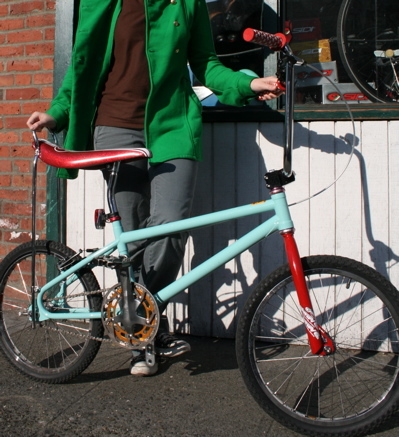 Her bike is the Kappa retro BMX frame that Jeremy Sycip modified to accept Schwinn Stingray banana seat and sissy bar. The bike is FREAKING cool, but it does have two drawbacks. The first one has to do with my ignorance when I built the wheels; I chose chromed rims for the bling-factor, forgetting all about how crappy they are for braking. Those XTR v-brakes howl and shudder on that chrome surface no matter what brake pad I use, and if it rains those brakes don’t stop at all. The second fault is that living in a hilly place like Seattle, multiple gears would be helpful. My girlfriend doesn’t know this yet because she’s never owned a bike with multiple gears. After a lot of thought, I’ve come up with a solution for both issues: a Sturmey-Archer 3-sp internally geared hub with a drum-brake. The great thing about the Sturmey-Archer hub is that, compared to installing a disc brake and derailleur, the bike frame doesn’t need to be modified except for spreading the dropouts from BMX standard 110mm to 119mm. That would be a deal-breaker if the frame was aluminium or light-gauge steel, but that good ol’ 4130 cromoly steel is pretty forgiving when it comes to coldsetting. Installed, the new hub will offer smooth, all-weather braking and effortless shifting while not compromising the shiny, clean lines of the bike. The only penalties are the additional cable and housing and the weight, which I’m trying to hide from my girlfriend. She was adamant that no additional weight be added to the bike. Strange that she’s not really a cyclist, but somehow she became a bike weightweenie. 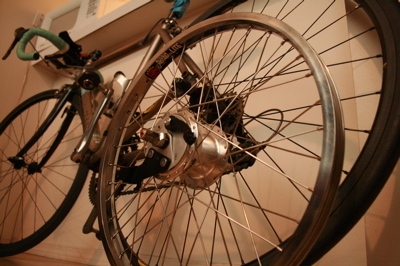 Disc brakes are all the rage now as they get lighter and more powerful, so it’s easy to forget about drum brakes. When low-maintenance and dependability are more important than high-performance and low weight, drum brakes really shine. The primary reason I bought this hub was for the drum brake; the internal 3sp gearing is just icing on the cake. The one thing I don’t like about the Sturmey Archer hub is the stupid stock cables. They have a head at each end, so you can’t trim them to size. In my case, I might need to lengthen the run, but I can’t use standard cables and housing unless I buy the special universal ends, which are sold separately. I have the shifter end now, but the rarer drum brake fitting isn’t available from my distributors until August or some such. Those fittings should just come with the damn hub in the first place. Yesterday I laced the hub into a Sun-Ringle Rhino Lite 20” chromed BMX rim. A couple of mechanics have told me in the past that they hate building BMX wheels because it’s hard to twirl the spoke wrench on 20”s with 36 spokes, but since my hands are small, I barely notice. The hub flange is 97mm but the spokes are only 180mm long on a 3-cross pattern, so the hub is visually dominating the space inside the rim. This is how the bike looked when I first gave it to my girlfriend, and the picture below is how it looked after I got the frame fixed by Sycip. 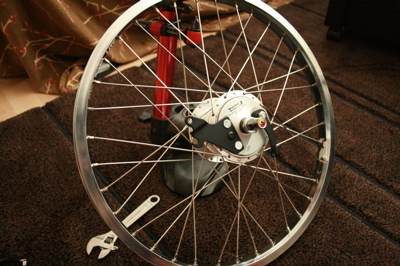 I’m going to put a chromed fork back on the bike when I install the Sturmey Archer hub. Next Next post: Hydraulics in my Future?